The Fortieth Day, Boa Editions, 2008. 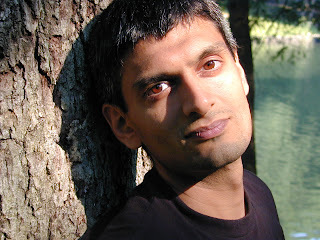 Kazim Ali is also the author of The Far Mosque (Alice James Books, 2005) and the novel Quinn’s Passage (blazevox books, 2004). A new novel, The Disappearance of Seth, which imagines, among other things, the future life of Layla Al-Attar, will appear from Etruscan Press in 2009. The first language of poetry I heard was the language of prayer, my father reciting from the Qur’an and other scripture. Part of poetry will always, for me, have the rhythms of those long-lines, the structure of those couplets, the second line answering the first in some way, usually not merely narrative; also the strangeness of a language I do not understand, clotted with consonants that do not exist in English, modulated by vowels that English-speaking throats can rarely manage. And of course, profoundly, poetry for me is the voice of another, reciting, to me, to an audience that sometimes recites along. I wrote myself together in time not to know something but to sketch something that was fleeting, and more often than not I wouldn’t know—I’d come to the last line of a poem and not understand what to write there and leave it blank, or leave it with a place-holder. It took time and an unfolding life to understand what I might be getting at or really what might be getting at me. It’s not that I think poetry is strange or removed from actual life—it’s that we are. But it’s us who are swirled into strangeness—eating synthetic fruit, drinking cola that is not cola, obsessed with reality television, the supreme achievement of our fantasy life: directed, edited, performed ‘reality.’ What do you do in such a life when someone suddenly speaks in tongues? Motivated mostly by alienation, rage, and yes, stupidity, the war is on, and what do you say to it? Layla Al-Attar, one of the premier artists of the Arab world was also the director of the national center for art in Baghdad. She was a leading voice against the US bombing missions against Iraqi military targets that continued long after the Gulf War ended in 1991; with great frequency these missiles were killing civilians, often far astray of their military targets. On the morning of June 27, 1993, President Bill Clinton ordered a strike of 23 tomahawk missiles. Seven of these went astray of their intended military targets and landed in residential areas of Baghdad. How do we even tell of actual things in the world? When they are so horrific we can barely actually imagine them? You should write the last line of this story yourself. Language that finishes itself in the mind requires the reader to be a community in participation with the writer and the text of the poem itself. When I try to construct a narrative it interrupts itself, when I try to write pure lyric, story appears, tendrils of plants growing through the pavement. On the fortieth day many things happen—throughout spiritual traditions and religions of the world, forty days is a period of spiritual charging and release. On the fortieth day you are most filled, quivering almost, not knowing what happens next, but certainly about to happen. To me the most exciting thing that happens in a poem is this reach—of the writer in the direction of the ineffable but with the fervent prayer of reaching some place, a hapless supplicant who flings himself at the flat, black sky, but hoping for heaven. The reader might come to a text in this same way, ready to leap somewhere, blessed to be in the presence of human experience. Because Clinton wished to “minimize possible deaths of innocent civilians,” the missiles were launched in the dead of the night. Was she awake, busy preparing for the planned major exhibition of her work? Or sleeping, warm and hovering in that place in between the dream-life and this one? What does it sound like approaching and did the windows shatter inwards or outwards? Layla Al-Attar’s death is the new moon in the sky of your historical consciousness; new moon because you didn’t know it was there, occluded and untold it disappeared in the drift of events in the end of the last century, but though unilluminated in the American perception of the world, it existed, exerting a gravitation pull nonetheless. Imagine it—there are countless events just like it, millions of narratives not untangling themselves as in the Western perception of fate—the Three Fates, kindly separating and measuring every life—but rather perhaps closer to the Islamic notion of kismet, an incredibly complex interconnected network of links between every living being throughout all time. We have to learn how to look in the myriad directions at once and to simultaneously understand the countless ways in which we cannot see. Death extinguished the life of a brilliant artist and destroyed hundreds of her paintings. We cannot measure the loss—it is more horrific that can be told in standard prose—it requires a grammar, vocabulary, and shape quite beyond. In science fiction time-travel stories the horror of death is told in future-time—someone changes their own past and all sort of people begin blinking out of existence, futures that don’t happen. The future changes the past of course. The poem, the writer, the reader, and the existing life are not fixed points in time and space. If, as HG Wells wrote, “War is a failure of imagination,” then poets and poetry will have something to say about it. But I think we should remember that the death of Layla Al-Attar was bought and paid for by our labor, our tax dollars, our support of US foreign policy. Al-Attar was a civilian, killed in peacetime. Perhaps there was a future in which Layla Al-Attar lived; she wasn’t home when the missile struck, or the missiles were never launched, perhaps the missiles were never constructed. I dreamed it without knowing it. Hovering between sleep and dream and waking life, I look everywhere for that text, wanting to wage pre-emptive peace in all the cities of the world by writing it in letters across the sky, wanting to read it out loud, to read it to you. "SMALL PRESS SPOTLIGHT: KAZIM ALI" was posted August 16, 2008.